Charging the world with energy. 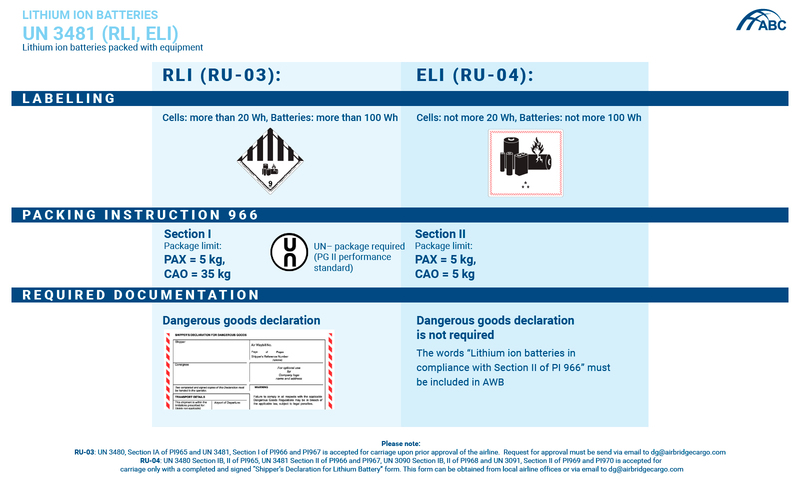 In our tech-savvy world lithium batteries are commonly used in a variety of consumer goods, from portable electronic devices, such as laptop computers, tablets, smartphones, household goods and children’s toys, up to serious airplane equipment and machinery. Providing an important advantage of relative lightweight, lithium batteries are not flawless. Their transportation comes with a number of restrictions and requirements in terms of safety and consistency. 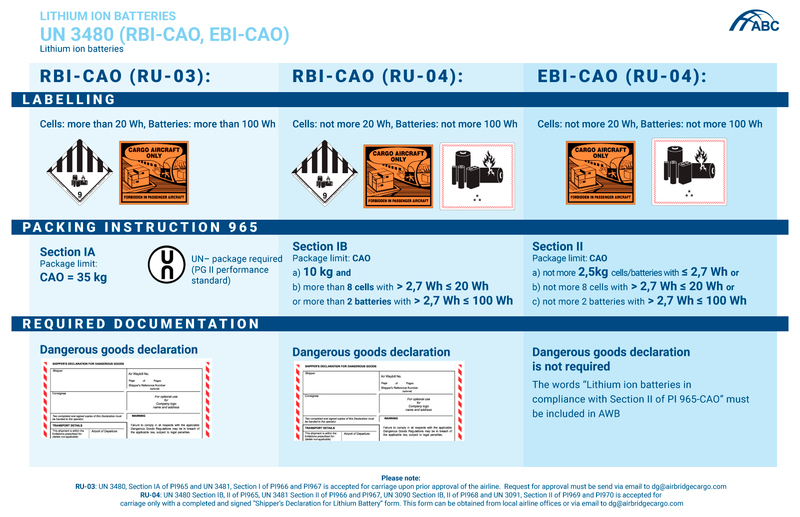 ABC team provides delivery solutions for lithium batteries, which are classified as Dangerous Goods (Class 9) due to possible spontaneous inflammation, in strict compliance with the latest industry standards and regulations. 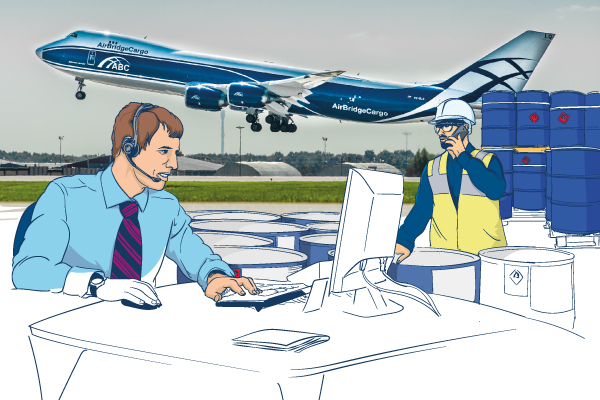 With ABC you can fully count on finding experienced support and expertise your shipment needs. Always. Worldwide. Depending on the type of the battery, our team of energy professionals will advise you on transport solutions tailored exactly to your needs. 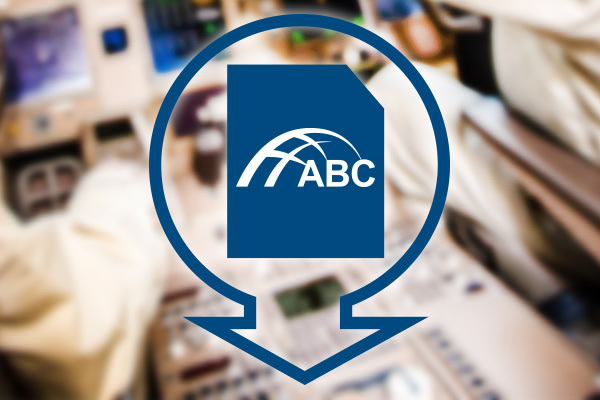 We at ABC make your experience simple and fast by dedicating dangerous goods specialists in HQ and at regional stations. They possess knowledge, required industry certificates, skills and expertise to handle each lithium battery delivery with precise care and attention. 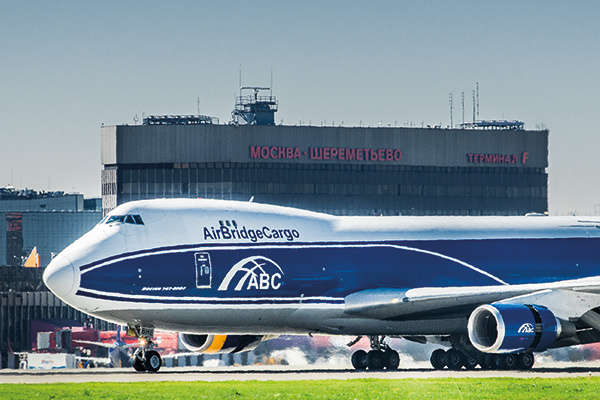 In order to guarantee high level of safety there are additional requirements to be met before cargo acceptance, which are documented in DGR IATA under airline variations RU-02, RU-03, RU-04. What kinds of Lithium batteries do we transport? 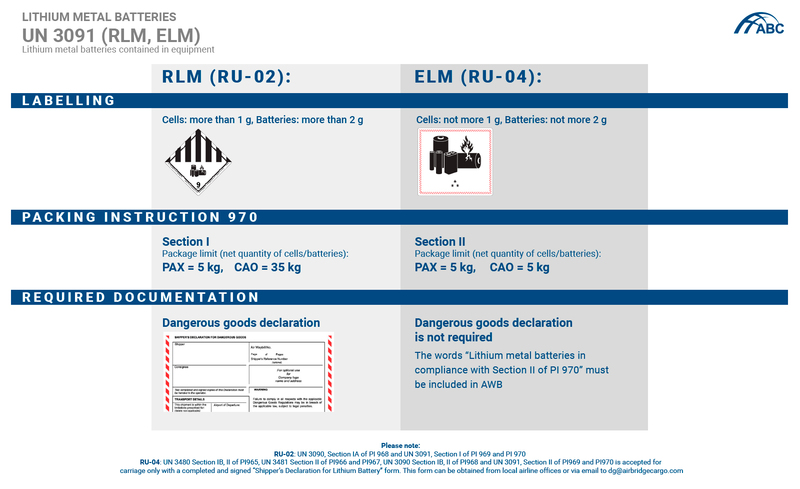 Lithium metal batteries - have lithium as a main component - UN3090 RBM, EBM and UN3091 RLM, ELM. These high charge density batteries are non-rechargeable, and are mostly used in remote control tools, calculating machines and watches. Lithium ion batteries - lithium batteries that contain electrolyte. 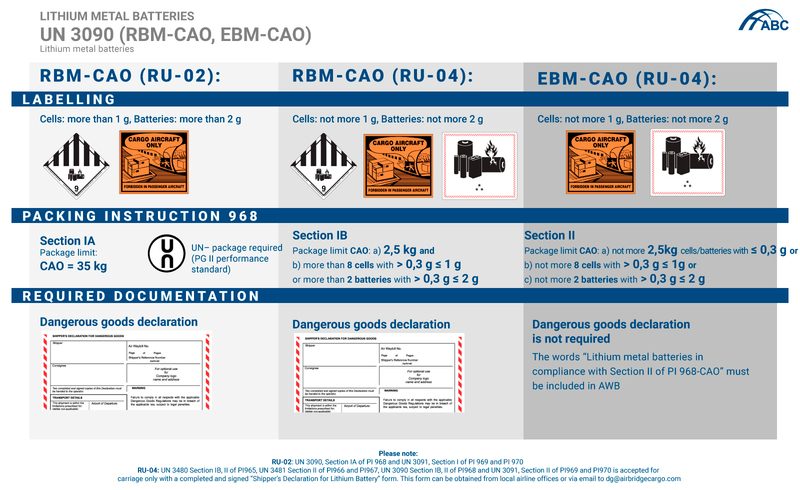 They can be recharged and are applicable for portable and home electronic tools – UN3480 RBI, EBI and UN3481 RLI, ELI. Lithium-ion batteries are used in such technologies as: smartphones, laptops, photo and video equipment and surveillance devices, etc. 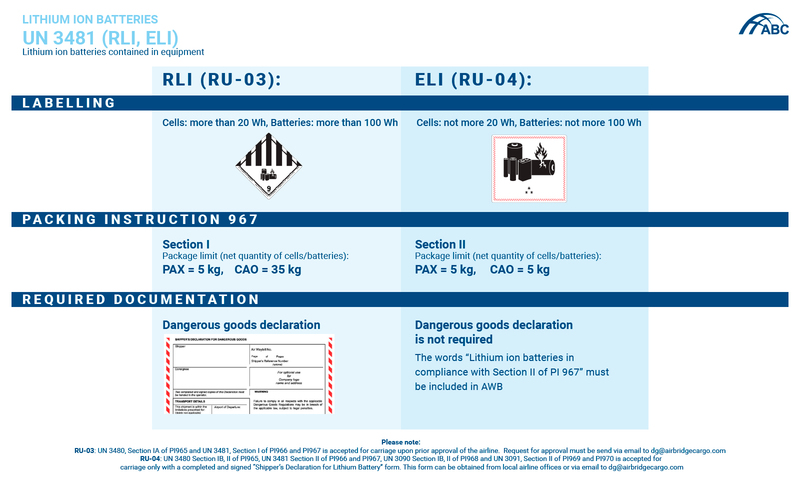 Below you will find classifications of Lithium ion batteries and Lithium metal batteries as well as an overview of packing requirements and declaration instructions.